Starting from the version 1.6.0 WPNewsman supports the integration with the WPML Multilingual CMS plugin. Thanks to this capability you can create the subscription form, email templates and action pages on different languages and collect subscribers speaking different languages to different lists. This article assumes that you installed and activated the WPML Multilingual CMS plugin and enabled desired languages for your site. After you did it, follow the steps below. 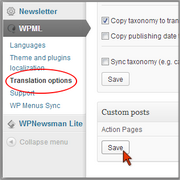 Go to the WPML plugin menu at the left hand side of your dashboard and click on “Translation Options”. Scroll down to the “Custom Posts” and check the “Translate” option for Action Pages. Click “Save” to the save the changes. Now go to the WPNewsman menu in your dashboard and click on “Action Pages”. Click on the “Add Translation” icon in front of the action page. In the new page editor select the language and click “Load”. If you have the CKEditor plugin activated, go to Plugins and de-activate this plugin to make the Load option work. After you load the translation for all action pages, re-activate CKEditor. When the page content on the selected language is loaded, click “Publish”. Load and publish all action pages on the language of your choice. The next step is to create different lists for subscribers speaking different languages. Go to the WPNewsman menu in your dashboard and click on “Lists and Forms”. Use the “New List” button to create new lists. For example, you can create the list called “test_EN” for English speaking subscribers and the list called “test_FR” for French speaking people. Now you have to make the subscription form for non-English lists. Click on “Edit Form” under the non-English list. Translate English text in the form to a different language, for example, to French, and click “Save”. Now click on “Email Templates” in the WPNewsman menu in your dashboard. Choose the list name created for non-English subscribers from the “System Templates” menu. Click on “Load Default Templates” and choose the language. The plugin will load the email templates translated to the language of your choice. Open each template in the editor and check if the translation is complete. If it’s not, translate the text yourself and save the template. Now you are almost done. The last step is to add the WPNewsman Subscription Multilanguage widget to your site. Go to Appearance -> Widgets and drag and drop the WPNewsman Subscription Multilanguage widget to the desired place on your site. Choose the right list for each language and click “Save”. Now WPNewsman will display the right subscription form depending on where the subscriber comes from and collect subscribers speaking different languages to different lists. Notify me about important plugin updates and new blog articles. We won’t share your email address with any 3rd parties. You can leave the list at any time.